State media distracts with giant bicycle get-togethers as the economy spins its wheels and the secret police represses. 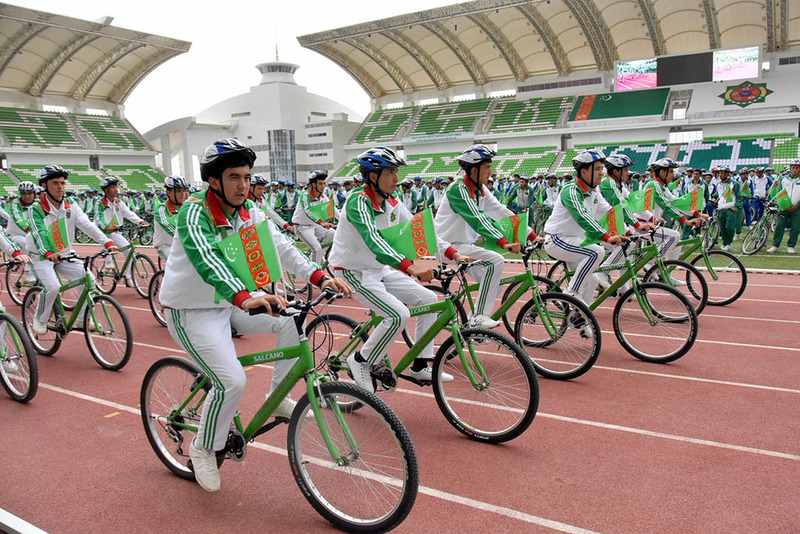 The president of Turkmenistan’s love affair with the bicycle has been elevated to a matter of state. On June 1, two days ahead of World Bicycle Day, 3,246 riders embarked on a mass jaunt that state media reported had earned the nation another entry in the Guinness Book of World Records. President Gurbanguly Berdymukhamedov spared no hyperbole in stating the case for his nation’s commitment to velocipedestrianism. "This historic event [World Bicycle Day] vividly demonstrates the growing international authority of our state, committed to the principles of peacefulness, humanism and fruitful cooperation, striving to use its geopolitical and geo-economic potential in the interests of all mankind,” Berdymukhamedov declared. These shenanigans appear intended in part to persuade global cycling bodies of Turkmenistan’s suitability to host some kind of international competition. And this courtship may be having an effect. Turkmen state media reported on June 2 that Union Cycliste Internationale president David Lappartient sent a letter congratulating Berdymukhamedov for his efforts in promoting World Bicycle Day. People trying to use other forms of conveyance are finding matters harder. In one incident that illustrated this in the grimmest of manners, a woman dropped dead after being denied permission to fly out of the country from Ashgabat International Airport. Many people have likewise recently been arbitrarily denied permission to go abroad. RFE/RL's Turkmen service, Radio Azatlyk, reported on May 30 that the woman felt unwell after being angrily berated by border guards, who noted that the traveler’s daughter had not returned with her from Istanbul following a prior trip. Her son, meanwhile, was detained and questioned after claiming he would relay details of the whole incident to Radio Azatlyk. Efforts to clamp down on the free flow of information about events inside the county are taking on an even stricter and systematic quality. In a June 2 report, Radio Azatlyk noted that a resident of Turkmenabat, just across the border from Bukhara, Uzbekistan, was questioned by the local security services and threatened with jail just for visiting the U.S.-funded broadcaster’s page on social media website Odnoklassniki. In this week’s roll of shame, Berdymukhamedov issued a “serious reprimand” to the head of the National Security Ministry, the successor agency to the KGB, Dovrangeldi Bayramov, for “improper performance” in his management of personnel. As ever, no details were forthcoming. The chairman of the State Migration Service, Mergen Gurdov, was chided for improper performance and shortcomings in his work. One can only speculate as to whether these upbraidings were necessitated by a sense of weakening state control over people’s movement or access to information. Although the sandstorms that battered Turkmenistan did not quite make it into the local news, state media did slightly lift its veil of denial with Health Ministry guidance on what to do in dusty weather. More footage trickling out of the country has documented a terrifying meteorological phenomenon. Radio Azatlyk reported that the sandstorms in Dashoguz province were so bad that state employees were forced to wash salt and sand off government buildings, mulberry trees and cotton plants. On June 1, the exile-run Alternative News of Turkmenistan outlet said that fierce rains and winds returned to the capital, tearing the roofs of a number of buildings and threatening a resumption of the flooding Ashgabat witnessed earlier in May. The Turkmen currency, the manat, has proven no less volatile than the weather. Chronicles of Turkmenistan cited sources in Dashoguz as reporting a black market rate of 25 manat to the dollar, up from 21.5 a week prior. Radio Azatlyk, citing its sources in Dashoguz and Ashgabat, put the rate at 27 manat to the dollar and said there was concern amongst traders it will jump to 60 manat. Johns Hopkin's Professor Steve Hanke, who tracks inflation at the Cato Institute’s Troubled Currencies project, currently judges Turkmenistan to have the second-highest inflation rate in the world, at 294 percent. International economists are paying attention. In comments to Reuters on June 4, representatives of both the World Bank and the International Monetary Fund called for Turkmenistan to devalue the manat – officially still pegged at 3.51 to the dollar – and undertake budget reforms. There is no immediate indication the government intends to take heed of that advice. On the energy front, Berdymukhamedov on June 2 met with the head of oil and gas company ARETI, Turkmen-born Russian national Igor Makarov. Beyond some pleasantries about cycling – Makarov is a member of the UCI management committee – not much seems to have come out of the encounter. Only two days prior, Berdymukhamedov had reportedly been demanding his minions make more of an effort attracting investment into the Galkynysh mega-gas field, which is what would fill the trans-Afghan TAPI pipeline now under construction. The problem for foreign investors is that while they are allowed to bid for work, Turkmenistan has stubbornly refused to grant any of them an equity stake. And since even at the best of times, Ashgabat is dismally delinquent in paying contractors on time, the appeal of turnkey contracts is weak. Reuters cited Oguzhan Cakiroglu, board member at Cakiroglu Grup, a Turkish metals and construction company, as saying his company has suspended work in Turkmenistan over unpaid bills. “The government has run out of financial resources, and it hasn’t been paying for finished contracts, let alone being able to pay for new ones,” he told Reuters. As the news agency reminded its readers, another perennial Turkish presence, construction company Polimeks, has for similar reasons suspended work on a highway linking Ashgabat to the Caspian port of Turkmenbashi. Unlike Turkmenistan and its bicycle-loving president, if conditions remain unchanged, the economy is going nowhere.